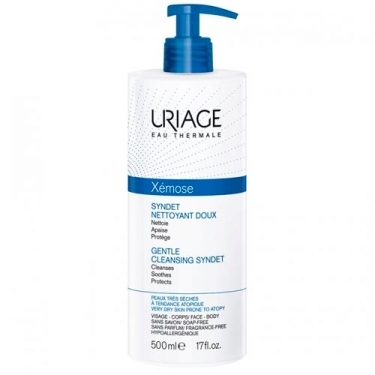 DESCRIPTION: Xémose Syndet Nettoyant Doux from Uriage is a gel-cream, which helps to clean while moisturizing the skin of the face and body. It has been specifically formulated for the daily hygiene of very dry or atopic-prone skin. Its unctuous foam cleanses the skin in softness. The Uriage Thermal Water, naturally rich in mineral salts and trace elements, appeases the drier skin. Its ultra-gentle cleansing base eliminates impurities from the skin without harming it, thanks to its physiological ph. The specific over greasing agents associated with the patented Cerasterol-2F complex avoid the drying effect of the water and provide comfort to the skin.